The study focuses on prospective English as a foreign language (EFL) teachers' perspectives on the use of Computer Assisted Language Learning (CALL) resources in teaching English as a foreign language context. In addition to examining prospective teachers' perceptions, the similarities and differences in their perceptions and factors affecting their beliefs about using CALL resources will be addressed. The study aimed to identify the prospective EFL teachers' perceptions of their existing skills to integrate CALL into their future professional practices. The perceived factors that will facilitate and inhibit their future teaching practices by using CALL resources and their expectations from the teacher education program in terms of providing the necessary training to use CALL resources in their teaching practices were examined. The perceived benefits and challenges of using CALL in EFL teaching contexts will be addressed from the participants' perspectives. Finally, the study provides implications for further research in addition to recommendations for EFL teacher education programs. In the field of English as a foreign language (hereafter, EFL), computer assisted language learning (hereafter, CALL) has received a lot of attention and the uses and effectiveness of integrating CALL practices have been addressed in the current literature (i.e. Brown, 1997; Garcia & Arias, 2000; Kilickaya & Krajka, 2010; Kilickaya & Krajka, 2012; Stokes, 1997). Within the current context of EFL classrooms, CALL has been addressed from three perspectives; one is the theoretical foundations and proposed applications of CALL (Chapelle, 2001; Levy & Stockwell, 2006), the second is the use and effectiveness of CALL practices in the language classrooms as well as using CALL as a language teaching tool (Blake, 2005; Hubbard, 2004); and finally the perceptions of the stakeholders (i.e. Teachers, students and developers) (Jamieson, Chapelle, & Preiss, 2005; Wiebe & Kabata, 2010). A number of technological learning theories have been used in the literature to define the intentions and perceptions of the subjects’ ways of using technology in a teaching context. One of the comprehensive studies on the theoretical frameworks of using technology in teaching, Lee (2010) examined four main theoretical frameworks; the expectation–confirmation model (ECM), the technology acceptance model (TAM), the theory of planned behavior (TPB), and flow theory (Koufaris, 2002) to propose a theoretical model to predict the participants’ intentions to continue using computer assisted learning tools in the teaching practices after graduating from the teacher education programs. On the other hand, Decomposed Theory of Planned Behavior (DTPB) developed by Taylor and Todd (1995) drawing on the Theory of Planned behavior (Ajzen, 1991) offers a focus on the attitudes, subjective norms and behavior control to examine the perception of the proposed behavior and in return predict one’s actions or future plans to implement. The proposed attitudes, subjective norms and perceived behavior control are explored through decomposing the frameworks of existing beliefs into belief-based indirect measures (Sadaf, Newby & Ertmer, 2012). Although current studies in the literature address the issues of using CALL in the language classrooms from tripartite perspectives, the perceptions of the prospective EFL teachers (hereafter, PTs) and the processes they are going through during their professional learning experiences within the teacher education programs have not been addressed in an EFL teacher education setting. Moreover, governments usually ignore the training of pre-service teachers while trying to implement some programs to provide the educational institutions with technological devices. As an example to these projects, one of the high-cost projects started to be put into practice in 2012 in Turkey and it is still in progress. The aim of this project is to provide ICT equipment to classes in order to achieve the ICT supported teaching until the end of 2013 in related to the goals that take place in the Strategy Document of the Information Society, the Development Report, the Strategy Plan of our Ministry and The Policy Report of ICT that have described all activities of our country in the process of being an information society and have been formed within the scope of the e-transformation of Turkey (http://fatihprojesi.meb.gov.tr). Although the project seems ground-breaking, the training of the pre-service teachers was ignored. 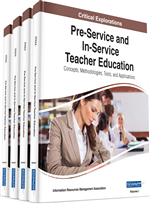 In-service training was included in the project, but the curriculum of the pre-service teachers of English remained the same.